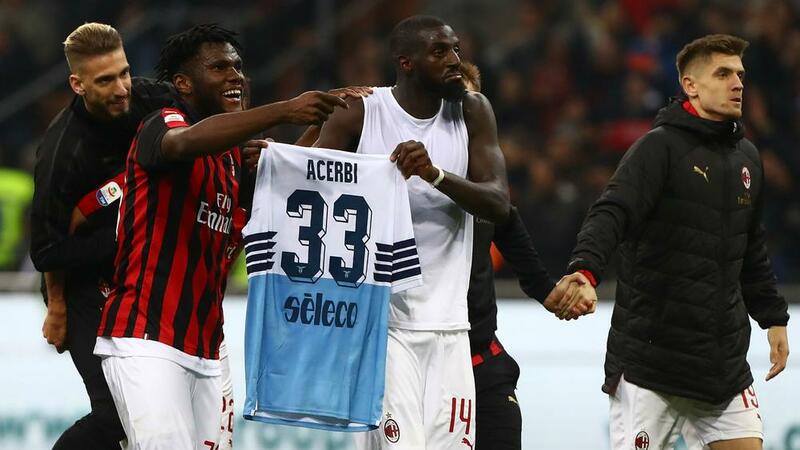 AC Milan have described Tiemoue Bakayoko and Franck Kessie's decision to celebrate AC Milan's win over Lazio with Francesco Acerbi's shirt as "naive" but "innocent". Bakayoko and Acerbi had been involved in a series of social media exchanges before Saturday's Serie A clash, with the Lazio defender insisting his team were, "stronger – there is no comparison" and the Milan midfielder responding, "Okay, I'll see you on Sunday". Bakayoko swapped shirts with Acerbi at full-time, but he and Kessie then paraded their opponent's jersey to the home fans at San Siro. Acerbi posted a picture of their celebration on Instagram afterwards, with the caption: "I'm sorry because I exchanged the shirt to put an end to the matter, fomenting hatred is not sport but a sign of weakness." Bakayoko has since apologised for what he described as a "playful gesture" and now his club have posted a statement on their website insisting there was no malice in the pair's actions. The statement read: "Yesterday evening, Tiemoue Bakayoko joined his team-mates under the stands with Francesco Acerbi's jersey, having just exchanged shirts a little earlier and showed it for a few seconds (along with Franck Kessie) to the public with the sole intention of celebrating an important victory with no mockery, no aggressive or anti-sporting intentions. "[It was] an innocent, naive response to the friendly exchange of tweets with Acerbi in the days before the game. "To confirm this, in noting that this episode had upset Francesco Acerbi, both Tiemoue and Franck publicly apologised to him. "Milan is founded on values ​​such as respect (on and off the field), equity and inclusion. Tiemoue and Franck know, share and express those values ​​every day."